Mashable's Amy-Mae Elliott recently asked "the million dollar" question: Why does the web love cats? "They're the perfect distraction from our hectic lives. You don't need any explanation or prior knowledge to understand the slapstick humor that animals provide. Cat videos and images are a quick hit of pure, unfettered ‘cute.' They're also entertainment in easily digestible doses." But there are plenty of cute animals on this planet, and it could be argued that dogs — also an incredibly popular house pet — are just as cute, silly, funny and weird as cats. 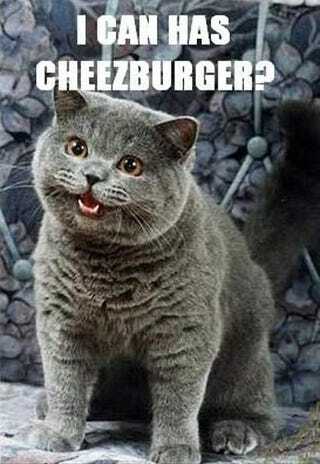 Yet, when it comes to viral videos and macros, cats rule. "When a dog gets in a box, it's because he desperately wants you to think he's cool. When a cat does it, it's because it suddenly felt like the right thing to do at the time. More often than not, it totally was. I think it's the very aloofness of cats that makes us want to caption their thoughts, or put them in front of a keyboard and see what happens. The many Keyboard Dogs were a failure not just because they came second, but because they were enjoying themselves far too much." Growing up, my family had a cat. Now I am a dog owner. But I think it's true that cats offer more mystery, more intrigue, more depth than dogs. Ceiling Dog is dumb and silly; Ceiling Cat is an infinite conundrum; an enigma wrapped in a riddle. Also, I'm scared of her.